Wonderful photos!Is that river near your house –> so jealous!! wow- what beautiful surroundings! I would get nothing done if I lived near that stream- great shots of your girls too! What a nice day, except for the falling in up to your chin part. Although, that looks like it turned out alright. My dad’s saying: “This is gonna end in tears!” 🙂 It still looks like fun though. Boots and a mini – too funny. 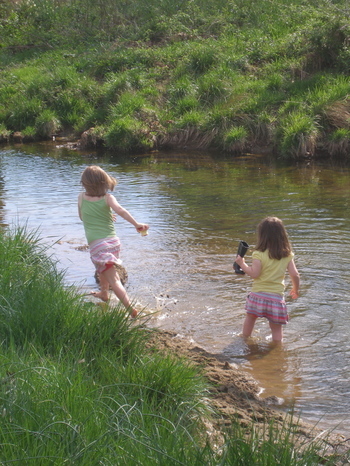 I remember how my oldest would always start near a stream, creek, or any body of water, but inevitably peel off the layers. Looks like much fun. just think, in two years, there will be a third little girl romping in the stream. yay for warmer weather!! What fun! I wish we had a stream nearby. Oh, wait, we do, but it is surrounded by poison ivy. Have fun creek stomping for us, will you, please? where you live looks like heaven… where I live we are in the middle of a long drought and everything is brown and dusty… the vivid green of your grass is devine… I’m jealous. boots + skirt pic is my favorite. footloose and fancy free. so cute! Whew, what a relief! I initially thought the mud spots were leeches! Mud I can deal with (albeit not well) but the thought of leeches on my little girls just about makes me feel faint! These pictures are adorable! Congrats on your new little one!